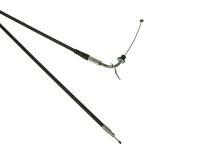 Complete Bowden throttle cable for Aprilia SR50 scooters up to 1997. 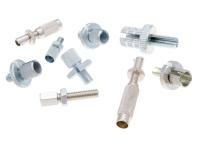 This cable features a PTFE internal gliding sleeve.The high self-lubricating properties of PTFE material ensure durable and smooth sliding, with no additional lubrication required. Never lubricate PTFE cables, as lubricants lead to swelling of the gliding material and that can ruin the cable.